This is the new and high-reaching tourist attraction in the village of Loen in Nordfjord: The cable car Loen Skylift brings you from fjord to mountain-top in 5 minutes. You step on board one of the two cable cars, Hugin and Munin, down beside the fjord in Loen. Following an ascent taking only minutes, you exit onto the top of Mt. Hoven, 1,011 metres above sea level. “From there, many excellent, clearly waymarked trails serve as a nice starting point for hiking excursions on all skill levels,” says Ann-Helen Blakset of Visit Nordfjord. The expansive view you will enjoy from the top of Mt. Hoven is plenty good reason to give the cable car a try. You can see Mt. Skåla and Lake Lovatnet to the east, Jostedalsbreen glacier and Olden to the south and Nordfjorden which extends toward Stryn to the west. 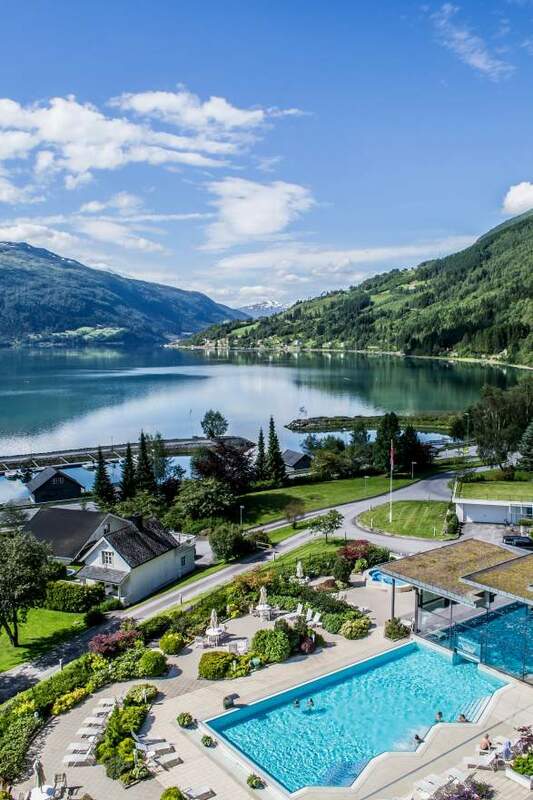 “Up at the top, you have a 210-degree panorama view of the fjord and surrounding landscapes as well as the opportunity to dine on local food at the Hoven restaurant. There is also a bar up there with an outdoor terrace, where visitors can sit and relax with something to drink,” says Blakset. There are alternative and more strenuous routes to the top. One of them is a climbing route, or Via Ferrata, which starts behind Hotel Alexandra down in Loen. 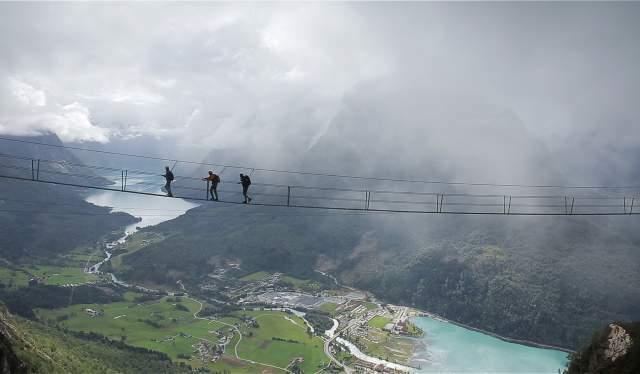 As part of the route up toward Hoven, you can cross the 120-metre long Gjølmunnebrua Suspension Bridge, the longest Via Ferrata bridge in Europe. It is suspended up at an elevation of 750 metres above sea level, so there are ample opportunities to feel some butterflies in your stomach. Another lofty attraction near Loen is the 1,848-metre-high Mt. Skåla. This peak hike is considered to have the greatest difference in elevation between fjord and mountain peak in Norway. “It is possible to stay the night in the Skåla Tower, which has been designated as Norway’s most special tourist lodge. The new tourist lodge, Skålabu, with its splendid design is located nearby and ensures increased capacity for overnight accommodation and is a superb spot for peak hikers during the winter season,” says Blakset. 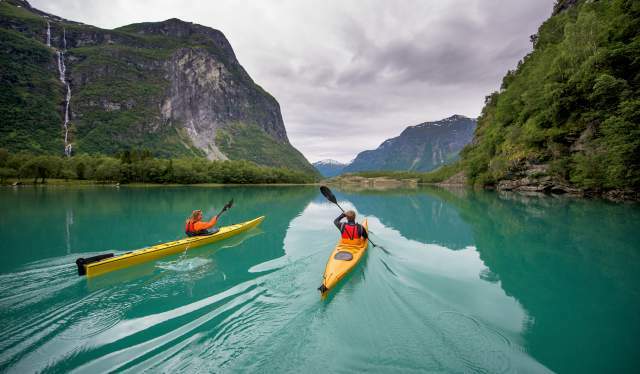 If you have strong fingers, you can climb on Beachen which is situated a few kilometres from Loen. A crag there keeps the mountainside dry even when it is raining, but this also means that this is not the most suitable location for total beginners. The routes are graded from 7+ to 9–, and nearly all of them are 30 metres long. 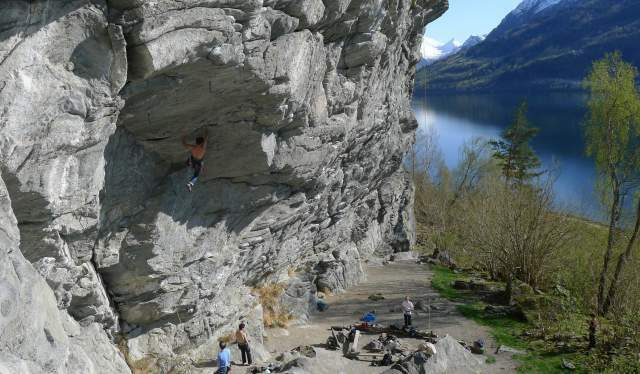 “It is a popular climbing area, and is actually considered to be one of the best in Norway,” says Blakset. Cable car with technology based on counter balancing: one car goes up as the other one goes down. If you prefer to stay in lower elevations, that is no reason to avoid Loen. Sande Camping rents out row boats, canoes and fishing equipment, so you can enjoy an outing on Lake Lovatnet and try your luck at hooking a trout. No fishing permit required. 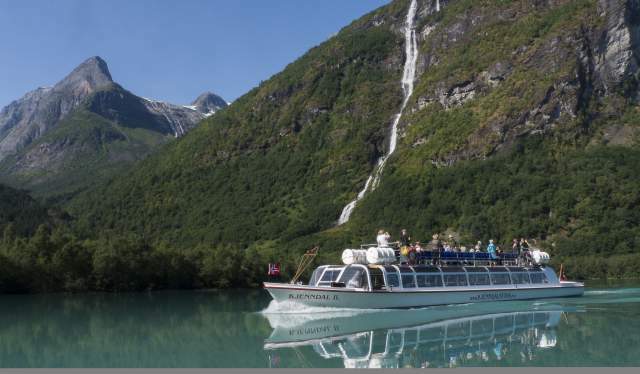 If you prefer larger boats, you can take a boat ride on the canal boat, MS Kjenndal, across Lake Lovatnet. It has space for 100 passengers and services the route between Sande and Kjenndal on Fridays and Sundays all summer long (updated timetables on nordfjord.no). The Kjenndalsstova café is in Kjenndal. You also have the option of getting to the café on your own steam by renting a bicycle from Loen Active and biking through Lodalen Valley. “Lodalen Valley is a real gem itself, and reminiscent of the idyllic settings of Norway’s national romantic era paintings. There are not many uphill stretches, so it makes for a nice bike ride we can recommend for most people,” says Blakset of Visit Nordfjord. The road along the lake leading in to the Kjenndalsstova café is 16 kilometres long, but you can always turn around if it becomes too exhausting. For example, at the picturesque Breng meadow, which has been used in many Norwegian advertising films. 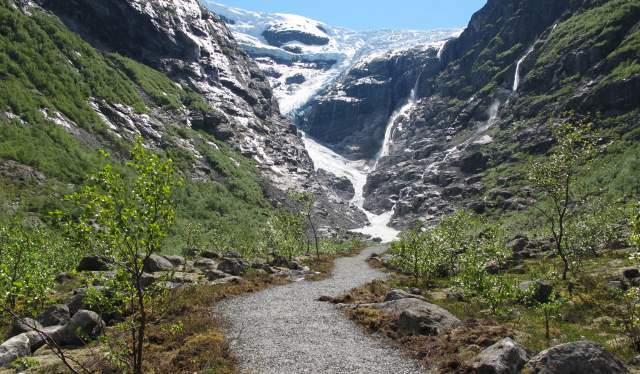 The Jostedalsbreen National Park is always nearby with its border extending a little way down along the mountainside. The Kjenndalsbreen glacier is located within the protected area, which is situated at the end of Lodalen Valley, and Bødalsbreen glacier is in the adjacent valley. 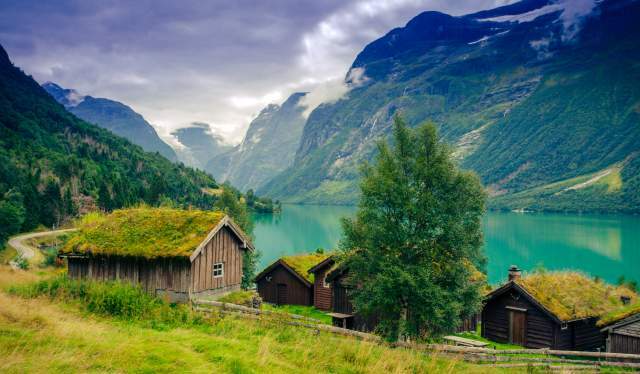 A short distance along the trail before you get to Bødalsbreen glacier lies an idyllic collection of mountain farm huts called Bødalssetra. As is the case with Mt. Skåla, another mountain peak located within the national park is Mt. Lodalskåpa, 2,083 metres above sea level. “This is the highest mountain in the national park, and it is also called the ‘Queen of Western Norway’,” says Blakset. As a way to finish off an active day, or as an alternative to going on an excursion, you can visit the swimming facility at the Hotel Alexandra, with its spa and in- and outdoor swimming pools.